A Small Pouch Laparoscopic Adjustable Gastric Band (high Band) Is Associated with a Lower Incidence of Complications. Midterm Analysis of 132 Patients. Introduction: Laparoscopic adjustable gastric banding (LAGB) is the least invasive procedure for surgical treatment of morbid obesity and is becoming a preferred method for surgical weight loss among bariatric patients in the USA. However, up to 20% of patients develop complications after the implantation of LAGB. Severe complications such as band migration, band infection, pouch and esophageal dilation may finally result in band failure. Pouch dilation has been reported to be as high as 37% in published studies. The optimal size for the LAGB pouch size has not been identified. In classic LAGB placement, the pouch is created mainly from the anterior gastric wall which is easy to dilate later. We adopted the idea of a small pouch (High band placement). 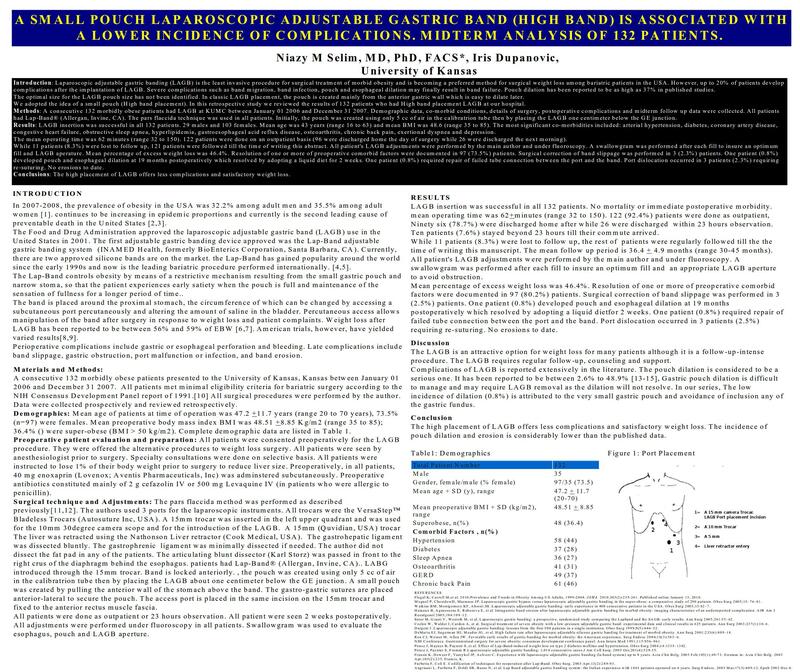 In this retrospective study we reviewed the results of 132 patients who had High band placement LAGB at our hospital. Methods: A consecutive 132 morbidly obese patients had LAGB at KUMC between January 01 2006 and December 31 2007. Demographic data, co-morbid conditions, details of surgery, postoperative complications and midterm follow up data were collected. All patients had Lap-Band® (Allergan, Invine, CA). The pars flaccida technique was used in all patients. Initially, the pouch was created using only 5 cc of air in the calibratrion tube then by placing the LAGB one centimeter below the GE junction. Results: LAGB insertion was successful in all 132 patients. 29 males and 103 females. Mean age was 43 years (range 16 to 63) and mean BMI was 48.6 (range 35 to 85). The most significant co-morbidities included: arterial hypertension, diabetes, coronary artery disease, congestive heart failure, obstructive sleep apnea, hyperlipidemia, gastroesophageal acid reflux disease, osteoarthritis, chronic back pain, exertional dyspnea and depression. The mean operating time was 62 minutes (range 32 to 150). 122 patients were done on an outpatient basis (96 were discharged home the day of surgery while 26 were discharged the next morning). While 11 patients (8.3%) were lost to follow up, 121 patients were followed till the time of writing this abstract. All patient’s LAGB adjustments were performed by the main author and under fluoroscopy. A swallowgram was performed after each fill to insure an optimum fill and LAGB aperature. Mean percentage of excess weight loss was 46.4%. Resolution of one or more of preoperative comorbid factors were documented in 97 (73.5%) patients. Surgical correction of band slippage was performed in 3 (2.3%) patients. One patient (0.8%) developed pouch and esophageal dilation at 19 months postoperatively which resolved by adopting a liquid diet for 2 weeks. One patient (0.8%) required repair of failed tube connection between the port and the band. Port dislocation occurred in 3 patients (2.3%) requiring re-suturing. No erosions to date. The high placement of LAGB offers less complications and satisfactory weight loss.